What? You can read? Marvelous! Got a companion? Well, you can read it together. Haven’t got one? Buy this and you soon will have. Fully illustrated by Chris Townson with the various characters appearing in God’s on His Lunchbreak, with the full lyrics to the tunes and the Story Behind the Creation of God. He is driving around with His pals in a Mini Moke, digging the funky toons on His iPod and doling out blessings to the less fortunate, and foreigners. Oh, the British love a sporting metaphor, and behave as though life can be reduced to the existential equivalent of a game of cricket. And this is indeed what the song does, with its reference to reaching the end of a long innings, packing up of bags and girding the sporting loins. The expression ‘Bad light stops play’ has long been in the John’s Adult’s vocabulary, referring to the ever-rising combined total of years lived by the various members (with one rather obvious exception). In real life, cricketers play in all kinds of oddly-named positions on the cricket field, and I have always been strangely attracted to those of ‘silly mid off’ and ‘long stop’. The latter won in this case, as it scanned better. Best BBC cricketing commentary award winner is the following exchange between two seasoned professionals: ‘Well, the bowler’s Holding, the batsman’s Willey”. The response was suppressed hysteria, followed by long silence as the mike was closed for some minutes. (It helps to know that, like many words in the English language, ‘willy’ is a slang term for the male member). (When I say ‘member’, of course, I don’t mean in the sense of someone who appears on the enrollment list, it’s actually more in the sense of…. OK, carry on). This Beatlesque ballad takes a darker turn as the end draws nigh, appropriately enough. It has a pedal bass in the chorus (chords changing over a motionless bass note) and rather Moptop-inspired a King Crimson-allke middle eight that goes round in sevens, aided by Enrico’s cleverer-than-thou 12th-note guitar parts. Oh, and a music-concrete outro, where the guitars impersonate Chris Townson’s drums falling down a flight of concrete stairs. These are a few of my favourite things. The illustration of this sad tale features the hapless John Chicken. Finding that he is rapidly approaching middle age, he reluctantly decides to head back to the pavilion while the light is still good. 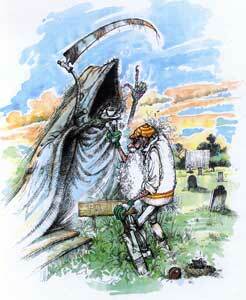 We see him leaving the gravestone-strewn cricket pitch behind as the sun sets slowly in West Hampstead. The Grim Reaper encourages him to come quietly with the offer of a nice cup of hot, sweet tea. (Actual size of the Chicken / Grim Reaper stand-off is A5, which is 148 x 210 mm as any fule kno. And in fact all the other pages are the same size. It’s the nature of the media, you see). Pick God up here from the Paypal shop. Currently it’s free with all orders while stocks last!